Dried Whole Ghost Chile / Chili Pepper (Bhut Jolokia) 2 Oz. Dried Whole Ghost Chile / Chili Pepper (Bhut Jolokia) 2 Oz. by TastePadThai at Smokey Robinson Foods. MPN: 1. Hurry! Limited time offer. Offer valid only while supplies last. 2 oz. Dried Whole Ghost Chile from India. Complete with seeds and stems. The pods can be used as they come, especially if they are going into wet food such as chili, beans or salsa. The powder can be used as is. Add very small amounts to your food and mix thoroughly. If you have any questions about this product by TastePadThai, contact us by completing and submitting the form below. If you are looking for a specif part number, please include it with your message. 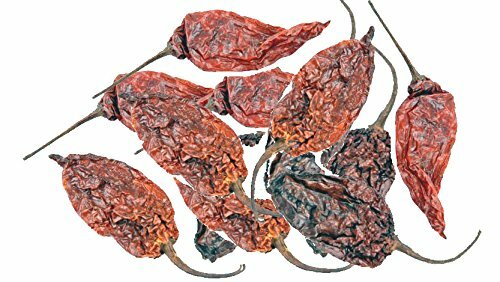 Badia Guajillo Chili Pod Spice, 6 Ounce - 12 per case. Alessi Fire Roasted Pepper, 12 Ounce - 12 per case.